It is raining. It rained yesterday, and the day before that, and before that; indeed it has rained for forty days and forty nights. Certainly feels like it. Had Noah gone into his garden to pick up fallen grapefruits - I'm extrapolating - he'd have worn wellies because the water would have oozed out of the soil over the top of his toes. Accordingly I have not been riding my recumbents because they are all wusses. (I believe that is the term. One endeavours to keep up-to-date with these neologisms, though one can hardly claim that 'wuss' is a particularly refulgent term. - Refulgent - now there's a word that shouldn't be allowed to fall into desuetude.) - My recumbents don't like rain because they each possess 150 inches of chain and I am one of those glorious obsessives who boil up chains in candlewax because oil + road dust = lapping compound. Because I am obsessive at least one of my waxed chains has 4,000 miles on it and no measureable wear. But candlewax isn't very good at rain repulsion, is the truth, and waxing chains is - well, you insert an appropriate neologism. To effect the purchase of two litres of milk I have been riding my Rain Bike. Milk deliveries here ceased when Corporate Executives learnt it was cheaper to have millions of plastic two-litre milk containers bobbing up and down in the middle of the Pacific Gyre than to wash and re-use glass milk bottles. This is called Progress, which Corporate Executives assure us you can't stop. Among car drivers glass bottles remain de rigeur for beer, and after contentedly swigging most of the beer they cast the bottles out of their passenger windows where they turn into punctures. Once I saw a drunken possum, sitting happily at the side of the road licking his paws next to an unbroken beer bottle. He was most comical. We're supposed to kill possums but I can't ever persuade myself to. It'd be like killing a teddy bear. I daresay your average New Zealander would classify me as a wuss. 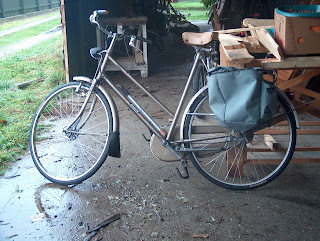 My rain bike came off the Dump and cost me $40 which is sixteen pounds in civilised coinage. I bought it for the bits because it has drum Sachs brakes front and rear and I also bought a Raleigh Sports - also a lady's model and also for $40 - because that had Sturmey Archer drum brakes front and rear, but then I noticed that both were intact except for air in their tyres and moreover both of them had chain cases. 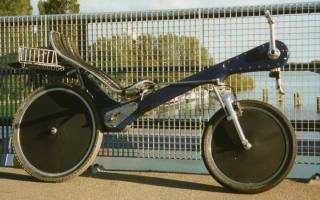 And on the back of their mudguards there were little stickers that said 'Kersten Tweewielers' and 'Van Megen Tweewielers Willemsweg 98 Tel. 565224 Nijmegen' and I had to keep them exactly as they were to remind me of going Abroad to the Continong where people made exotic sounds with their mouths that sounded very like speech but couldn't have been because it wasn't English, and where there were fabulous little cafes where you could sit and drink cold lager that tasted Foreign and you could buy schnitzel that tasted superb until someone told you how veal is reared. - Exam question: Discuss the morality etc. and we're back to milk production again. The Dump had these two ladies' bikes, one large and one small, and each had 3 hub gears which are fine for the Motueka valley road which is flat but must have been taxing to a pair of Dutch lesbians who emigrated from the flat lands of Holland, I deduce, to the hilly country of New Zealand. Because otherwise they wouldn't have taken them to the Dump. Anyway now I have two bicycles that don't get their chains waxed. They get liberally soused in oil. And the oil picks up no abrasive road dust because the chains are inside these cases and my trouser-legs pick up no oil, actually because they're safely tucked up inside my wellies when I ride my Rain Bike, and my wife rides her Rain Bike to Motueka secure in the knowledge that nobody'll nick it from outside the surgery because what fifteen-year-old would want a Raleigh Sport with three gears and drum brakes and a chaincase? However, you are right. That is, actually, the uncomfortablest saddle in the entire world. I just wish I was as clever as Clemens Bucher.